FNAF: Ultimate Custom Night is a survival horror game. You have to survive the night in a pizzeria, watching some animatronics rise and wander around, trying to reach and kill you. There are some protection methods at your disposal, but what matters most is your constant attention and alertness. Watch them move via cameras and take the necessary steps to protect yourself. FNAF Ultimate Custom Night download links available only for PC. Five Nights at Freddy’s was such a success mostly because of its love for details and the untold part of the story that was only hinted of. Not only was it a great horror, but also an invitation for co-creation. Integrated both into reality and mass culture clichés, FNAF has few alternatives for a gamer wishing for intellectual games, with something large behind. And the great part of it was around the animatronics. Each time it was a new story with a horrible background that allowed introducing new ones, each with their own story and recognizable appearance. Now the game gathers them all in the same place, some wishing you right as they’re programmed (though their right is killing), some inclined to kill. This gathering is a good reason to download FNAF Ultimate Custom Night and give it some time. The Ultimate Custom Night offers much of fun to those fond of the series. As you launch it, you have the selection of 50 animatronics – all of those we know from the previous installment, and some new. Their AI can be adjusted right here, with useful options, like zeroing all, adding 1 point to all of them, setting all to 5, 10, or 20 points. As you progress, you unlock the other three of the four offices available. There are also power-ups you can buy for Faz-coins, that can keep some animatronics out of the process, lowering the temperature (that keeps some idle), raising battery level to 102% or giving 3 Faz-coins needed for activating protection from some animatronics. As you start the game, you see the keyboard layout for quick activation of different features, like fan, light, music box (yes, the tune from Part 2 is the same), and other features to check these animatronics or keep them idle. You’ll need to learn these keys if you want to react fast. The gameplay is similar to what we saw in other installments, though here it’s much more intense. You only need to stand one night, but it will be harder. FNAF Ultimate Custom Night for Windows (7,8,10) is easily installable. Alas, Windows is the only platform this game is available for. Thus, there is FNAF: Ultimate Custom Night for tablets, but only for those running Windows. The keyboard is not necessary, but it makes the process much easier. Mac users can survive the lack of FNAF Ultimate Custom Night for Mac just by running Windows on a virtual machine. It will have reduced performance, but, luckily, this game won’t require much of it. So far there is no console support. So instead of playing FNAF: Ultimate Custom Night for PS4, PS3, or other consoles you’ll have to get back to your PC once again. You can get UCN from 2 official resources - Steam or GameJold. Links for this sites you can get at Download Page. If you want to install FNAF UCN without Steam platform use Gamejold. Click the "Download" button to get the UCN Launcher. After the file downloads, run it. In terms of plot, this one is the poorest to contribute to FNAF universe. But as a pure fun piece, it’s quite great. The complexity is the highest, as you have to watch doors, vents, air tubes and other potential doorways for animatronics. There is not just more of them: it’s more than all of them. This installment is completely free and available only for PC, with no plans to ever release FNAF Ultimate Custom Night for Xbox One or, say, mobile devices. There’s even less hope for those on older consoles to have, say, FNAF: Ultimate Custom Night for Xbox 360. That puts it aside from the official issues. As we know, by 2018-2019 Scott Cawthon is all about side projects of FNAF. It includes books (he has already written five together with Kira Breed-Wrisley), a movie already in production, and more spin-off games. In fact, at the beginning of our FNAF Ultimate Custom Night review, we should have emphasized that it’s a game, not any other art piece of the franchise. So we are observing FNAF going mainstream, and no matter what old school fans think of it (spoiler: they never like it), the story gets great. In fact, it’s a bit of fan service from Scott Cawthon. One of the most famous indie developers had once promised not to release sequels to his cult game; well, this one is a spinoff, so the word is kept. It’s pleasant to select the animatronics you like and set the AI, but it all looks like cosplaying the originals. In movie terms, it looks like manufacturing a Chucky doll after Child’s Play release. It’s good to have it as a fan object, but it’s after the story you love, not within it. Yet FNAF: Ultimate Custom Night for PC is a good way to touch the stories you love about FNAF once again. 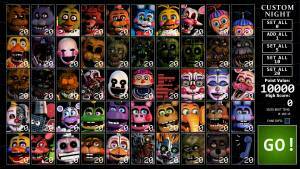 Download FNAF UCN and try it your self. 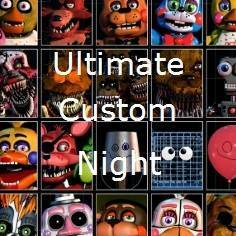 ultimate custom night, fnaf ultimate custom night download, ultimate custom night online, fnaf ultimate custom night, fnaf ultimate custom night online, fnaf ultimate custom night gae online, ultimate custom night online play, fnaf ultimate custom night free play online. 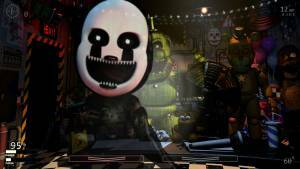 These links follow to webpage, where you will find links to official sources of Five Nights at Freddy's: Ultimate Custom Night game. If you are Windows PC user, then just click to button below and go to the page with links. FNAF: Ultimate Custom Night Online If you don't want to install FNAF Ultimate Custom Night game online, you're out of luck. The game must be downloaded and installed on your PC, as Scott Cawthon (developer) does not develop flash games and there is no official confirmation of this rumor. 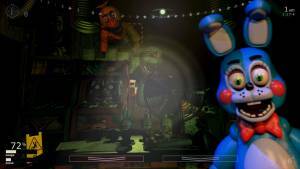 All other resources that offer to play UCN game online are engaged in a deception of consumers. You can get this game from official sources, links to which you will find on the download page. News From Dec/11. Upcoming Projects Mega-Thread! Hello, guys! We have some news from Ultimate Custom Night's developer. We are happy to share it with you, so check it out! "There are a lot of great things being worked on, and most of them will arrive in 2019, including new ports, new games, and new books. The movie progress is still slow, but that's OK because I want to get it right. Everything else however is moving full speed ahead. Movie News Five Nights at Freddy’s (first movie): New script being worked on OK guys, I had a script written; Jason liked it, and Chris Columbus liked it too, but I tossed it. I had a different idea for it, one that I liked better. I take responsibility for this delay; it’s my fault. It’s been a real challenge for everyone, including myself, to come up with a good screenplay for this. But I’m determined to find the right story. I’m sticking to what I’ve always said, either the right movie gets made or no movie gets made. I hate delaying a project that’s already seen so many delays, but I have to go with my instincts on what I think will be exciting and interesting, and what I think the fanbase will really want to see. If that means that I have to start over ten more times, then that’s what I'm going to do. The good thing is that each attempt gets better and better, in my opinion. So, despite the delays, it's going in the right direction. One thing that most of you might want to know is that the movie (and sequels I hope) will take place in the universe of FNAF 1-3 only. 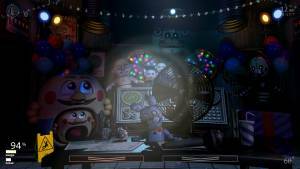 The games after Five Nights at Freddy's 3 will not exist in the movie universe. Like it or hate it, I felt that this was the best portion of the storyline to really focus in on. Game Projects: FNAF VR: (40% complete) This game is looking terrific. I’m working with a company called Steel Wool to bring the VR game to life, and these guys are making some crazy stuff. If you liked repairing Funtime Freddy up-close in Sister Location, just wait until you try to do something like that in VR, up close, personal, with these huge animatronics that are just one mistake away from jumping at you. I refused to test it the first time and had my son Braden test it instead. (The repair section is one small part of the game.) And, for the first time, you’re going to all get to see an actual stage performance from the classic band! FNAF AR: (10% complete) The AR game is well under way, and while I’m not going to reveal any gameplay details yet, I will say that the impending doom of something hunting you will keep you up at night. FNAF: Into Madness (0% complete) This is the next game that I want to work on myself someday, a compilation of several previous gameplay ideas in the same vein as Update 2; just a free game for the fanbase. There isn’t a guarantee that it will happen though; I’m still recovering from the first four years! :) Console Ports: (20% complete) I’m working closely with the people at Clickteam to create new, improved, HD ports of all of the original games! They will be released on Android, iOS, Switch, XBox and PlayStation! AAA Game: (0%) There is a BIG deal in the works to create an incredible big-budget game! I can’t reveal any details yet as this project is still in its planning stages, but I’m working closely with the studio involved to ensure that it delivers what (I think) FNAF fans will want to see! New Book Series: (20%) There is a new line of books on the way from Scholastic! This will be very different from the original book series, as it will be a collection of short horror stories that takes place in the FNAF universe. The series will launch with five books, each containing three different short stories with unique characters and plot lines, some connected directly to the games, and some not. That’s everything for now! Time for more coffee!" Hello everyone. We are the biggest Ultimate Custom Night game fans. Here we collected all useful information about this game. We provide the honest review, walkthrough guide and tips, news about updates and future release on Playstation 4, Xbox One and Nintendo Switch. Also, we are working on the community category that will be released in the nearest future. Play Ultimate Custom Night and join our fan community. (C) 2019 Ultimate Custom Night Fansite. Honest review and useful walkthrough guides. All Rights Reserved.